Accepting the Liberty Medal for his humanitarian work in Africa, Bono exhorted Americans to keep working to solve the world's problems and spoke of those who are without freedom. "When you are trapped by poverty, you are not free. When trade laws prevent you from selling the food you grew, you are not free," the Irish rocker and activist said Thursday night as he stood steps away from Independence Hall and the Liberty Bell. "When you are a monk in Burma this very week, barred from entering a temple because of your gospel of peace ... well, then none of us are truly free," he said. 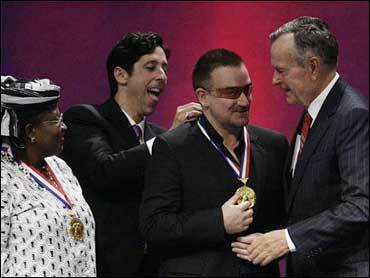 Bono and the organization he co-founded, Debt AIDS Trade Africa, received the award from former Liberty Medal recipient President George H.W. Bush at the National Constitution Center. The award comes with a $100,000 prize, which Bono said will be donated to the organization. Ngozi Okonjo-Iweala, former finance minister of Nigeria who sits on the group's policy advisory board, accepted the award for the Washington-based group. Bono, frontman for the band U2, co-founded DATA in 2002 to work with religious groups on global disease and hunger issues. In 2005, U2 was a headliner for the Live 8 concerts held to raise awareness about African poverty and pressure world leaders to cancel debt for the poorest African nations. Calling America "my country," Bono said he's a fan of the United States despite its problems because of its contributions to the world. "Your America is where Neil Armstrong takes a walk on the moon," Bono said. "Your America gave Europe the Marshall Plan. Your America gave the world the Peace Corps. "America is not just a country, it's an idea, isn't it? It's a great and powerful idea. The idea that all men are created equal, that we are endowed by our Creator with certain unalienable rights. That among these are life, liberty and the pursuit of happiness." Bono exhorted Americans to pledge to continue to help the world. "America has so many great answers to offer," he said. "We can't fix all the world's problems, but the ones we can we must." The Liberty Medal was established in 1988 to honor individuals or organizations whose actions represent the founding principles of the United States. Last year, former presidents Bush and Bill Clinton won the medal for putting politics aside to help raise more than $1 billion for disaster relief efforts after Hurricane Katrina and the 2004 tsunami in southeast Asia. Previous winners have included Afghan President Hamid Karzai, former U.S. President Jimmy Carter and U.S. Supreme Court Justice Sandra Day O'Connor. The medal was first awarded in 1989, and six recipients have subsequently won the Nobel Peace Prize.